Two of the attributes of the late Victorians were large families and the multi-skilled “polymath”. There was more to Arthur Conan Doyle than the creation of iconic detective fiction, and to C B Fry who played cricket for Sussex and England who also held a world athletics record, won an FA Cup winner’s medal and felt able to turn down the offer of the throne of Albania. In the Hon. Alfred Lyttelton, the two attributes of belonging to a large family and being the multi-skilled polymath combined, although in many ways he was primus inter pares. Alfred was the youngest of the seven sons of George, the 4th Lord Lyttelton, and his wife Mary nee Glynde. There were also four daughters. Alfred followed his father and each of his six older brothers from Eton to Trinity College, Cambridge, where he not only excelled at his studies but established himself as a sportsman of the highest rank. He gained his cricket blue in each of four seasons (1876 – 79) and was captain in the final year. He also gained blues for association football, real tennis, athletics and raquets. During his first year he played for the losing Old Etonians football team in the FA Cup Final, and the following year in the England team that lost 1-3 to Scotland. Brother Edward, in the year above, matched him in both football and cricket achievements. Alfred had a long and distinguished career as a first class cricketer, playing for Middlesex, Worcestershire and England. He was a wicket-keeper & batsman, who raised his wicket-keeping skills to the level where he no longer needed the cover of a long-stop on the boundary behind him. 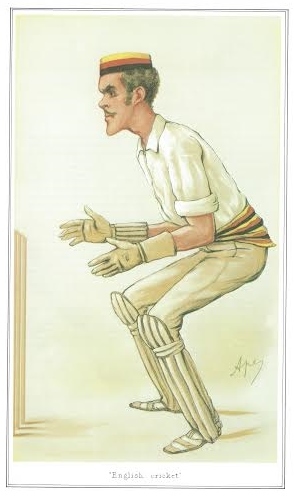 He played in the 1882 England v Australia match, which England lost, leading to the creation of “The Ashes”. Two years later, with England again struggling, Lyttleton handed over the wicket-keeping to another player and bowled (whilst still wearing his pads). He took 4 for 19, which remain the best bowling figures for any wicket-keeper in a test match. He played little first-class cricket after the end of 1884 season, turning his attention to his developing legal practice – he was an able and successful barrister. Clearly one career at a time was not enough for Alfred and so he looked for another one and chose politics. In 1895 The Hon. Alfred Lyttleton was elected MP for Warwick & Leamington where he became a playing member at the Leamington Tennis Court Club. He was national real tennis champion and held his national title for ten years, but whether the existence of the club in Bedford Street was a factor in choosing his constituency is not recorded! In the latter half of the 1890s there was growing pressure locally for the formation of a “gentlemen’s cricket club”. The pressure no doubt increased when Alfred, the local MP, was elected to the Presidency of the Marylebone Cricket Club, and in February 1899, a meeting in the Town Hall formed the present Leamington CC. At the AGM of 26th. February The Hon. 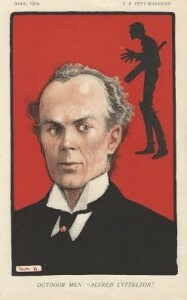 A. Lyttelton, K.C., M.P. was elected a Vice President. Alfred Lyttleton’s political career developed and in 1903, in the “Trinity Reshuffle” he joined the cabinet as colonial secretary, under the Prime Minister of the time A J Balfour, his brother in law. However that did not prevent him losing his seat in the 1906 Liberal Landslide, the only time until 1997 that the seat was not held by a member of the conservative party. Alfred returned to his law practice and continued playing recreational cricket until 1913, when in his last game at the age of 56, he scored 89 against Bethnal Green Tradesmen. Unfortunately, as a result of a blow to the body during the match he developed an internal abscess and never recovered from the operation to remove it. As he lay dying he is supposed to have said to one of his brothers, “Don’t let them make too much of the cricket ball – just a piece of bad luck”. A full and successful life cut tragically short. On 13th May 1895, Lyttleton played in a local match, a ‘Married v. Singles’ game at Milverton CC, where he singularly failed to impress local voters, being out first ball. In August that year, luck was with him. at Newbold Revel (Stretton under Fosse), at that time a highly prestigious cricket venue, Lyttleton batted alongside the illustrious C B Fry, and outscored the master, – scoring 109 runs as against Fry’s 64. Lyttleton’s team squeezed home by 14 runs.